Rep. Ilhan Omar, D-Minn., appears at a House Education and Labor Committee markup on Wednesday. For the second time in as many months, the freshman Minnesota Democrat has provoked contentious debate on Capitol Hill over rhetoric that many lawmakers — including senior Democrats — view as anti-Semitic. 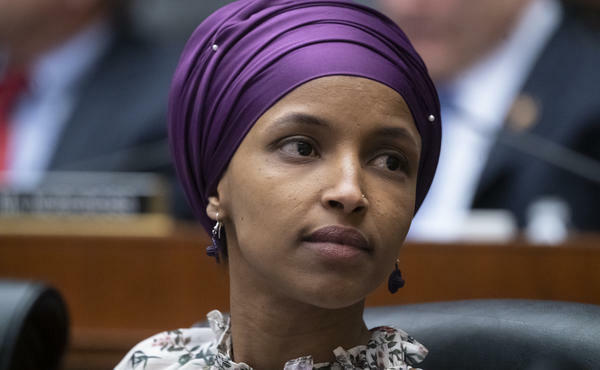 It is the second time that the House voted to condemn anti-Semitism as a rebuke of Omar, although she is not named in either resolution. The first time was in response to tweets that played on tropes about Jewish money and influence on American politics. Omar did not speak on the House floor during the debate but released a joint statement with the two other Democratic lawmakers who are also Muslim — Rep. Andre Carson of Indiana and Rep. Rashida Tlaib of Michigan — calling the vote on the resolution "historic." "It's the first time we have voted on a resolution condemning Anti-Muslim bigotry in our nation's history," the three Democrats said. The resolution Thursday was put forward after Omar made comments at a Washington, D.C., coffee shop last week in which she again questioned the pro-Israel lobby's influence in American politics. "I want to talk about the political influence in this country that says it is OK for people to push for allegiance to a foreign country," she said. "I want to ask why is it OK for me to talk about the influence of the NRA, of fossil fuel industries or Big Pharma and not talk about a powerful lobbying group that is influencing policies?" For many lawmakers, her comments played off the "dual loyalty" accusations that have been used to harass and persecute Jews throughout history. This time, Omar refused to apologize for her remarks, and a number of prominent Democrats came to her defense, including fellow freshman Rep. Alexandria Ocasio-Cortez of New York. It served to expose a generational rift inside the Democratic Caucus, with younger, liberal Democrats willing to criticize Israel and U.S. foreign policy in a way that older, long-serving Democrats generally oppose. Party leaders initially decided to punt on the resolution vote to address concerns across the caucus about the text of the resolution. Democrats reversed course early Thursday and announced that the House would vote on it hours before the resolution was even released. Democrats feared that House Republicans would be able to force a vote on the floor if the party did not take control of the matter. House Speaker Nancy Pelosi, D-Calif., was an early supporter of the resolution that began to take shape over the weekend. On Thursday, she said she did not believe Omar harbored anti-Semitic views. "I feel confident that her words were not based on any anti-Semitic attitude but that she didn't have a full appreciation of how they landed on other people where these words have a history and a cultural impact that might have been unknown to her," Pelosi told reporters. Republicans have amped up attacks against Omar, with one top Republican suggesting that Democratic support of her could lead to violence. "Representative Omar embodies a vile, hate-filled, anti-Semitic, anti-Israel bigotry," House Republican Conference Chairwoman Liz Cheney, R-Wyo., said Wednesday. "This is a time for the Democratic leaders in this institution to do the right thing. They should remove her from the House Foreign Affairs Committee. They should stand up to her. They should stop empowering her disgusting hatred before it turns into horror." House GOP leaders are calling for her removal from the Foreign Affairs panel, but Democrats have not gone there. The panel's chairman, Eliot Engel, has been a leading critic of Omar's rhetoric, but he has not called for her ousting from the committee. Thursday's resolution was co-sponsored by Democratic Reps. Jamie Raskin of Maryland, who is Jewish, and Cedric Richmond of Louisiana, who is black. Members of the Congressional Black Caucus had also voiced concern about the resolution and the haste with which the House was moving to condemn a Muslim African-American woman while other offensive comments made by lawmakers — and President Trump — often go by without notice or attention. To accommodate members' concerns, the resolution was broadened to condemn all forms of racism and bigotry beyond anti-Semitism. The controversy spilled out across the U.S. Capitol and onto the 2020 campaign trail. On Thursday morning, Senate Majority Leader Mitch McConnell, R-Ky., criticized House Democrats for their handling of the matter. "Apparently within the speaker's new far-left Democratic majority, even a symbolic resolution condemning anti-Semitism seems to be a bridge too far," he said. Leading 2020 Democratic presidential contenders, including Sens. Bernie Sanders, Kamala Harris and Elizabeth Warren, came to Omar's defense this week. Sanders, who is Jewish, said attacks on Omar from Republicans are intended to silence debate about U.S.-Israel foreign policy. "What I fear is going on in the House now is an effort to target Congresswoman Omar as a way of stifling that debate," Sanders said in a statement, adding: "That's wrong." Harris also raised concerns about Omar's personal safety. "We should be having a sound, respectful discussion about policy. You can both support Israel and be loyal to our country. I also believe there is a difference between criticism of policy or political leaders, and anti-Semitism," Harris said. "Branding criticism of Israel as automatically anti-Semitic has a chilling effect on our public discourse and makes it harder to achieve a peaceful solution between Israelis and Palestinians," said Warren. "Threats of violence — like those made against Rep. Omar — are never acceptable." The House took a surprisingly tricky vote to denounce anti-Semitism. The resolution made the floor after the remarks by a Minnesota Democrat questioning American supporters of Israel. But it never specifically mentioned Ilhan Omar. And it was expanded to denounce many, many other forms of hate. NPR congressional correspondent Susan Davis has been covering this story. She's in our studios. INSKEEP: What have the last few days around the House of Representatives been like? DAVIS: It's been an unusually tense week for the new majority that, I think, exposed a lot of the generational and cultural divides inside the Democratic Party that prove that they have a difficult time governing when you have such a ideologically diverse, racially diverse group of people trying to get them all on the same page. INSKEEP: ...The Minnesota Democrat, is a freshman, very young as members of Congress go and had a lot of supporters on the younger side of the caucus, right? DAVIS: She did. She's also one of the first two Muslim women to serve in Congress. She wears a hijab. She's one of these high-profile freshmen. And when party leaders and party chairmen were quick to take her comments and want to condemn them, I don't think they anticipated the uprising of support for Ilhan Omar. I think there was support for lawmakers who want to be more critical of U.S.-Israeli foreign policy. And I do think among the congressional black caucus, there was a certain amount of unease with which Congress has moved to quickly condemn a young, black woman but so often has ignored or let by other controversial or offensive things other members of Congress have said. INSKEEP: Oh, and there were members of Congress on the Democratic side who find Republicans cynical to be criticizing this when they have supported a president who - I don't know - his final campaign ad featured prominent Jewish financiers, for example. DAVIS: That is correct. And Republicans have really seized on this. They have called for Ilhan Omar to be removed from the House Foreign Affairs Committee. Democrats have so far rejected that. Oddly, in the end, Republicans showed some divisions on this resolution. About two dozen Republicans ultimately voted against it. One of them was Liz Cheney. She's a Republican from Wyoming. She's the No. 3 Democrat - or Republican in leadership. And she made the argument that she thought Democrats had watered this down too much to include all forms of hatred. And it wasn't clear enough in condemning anti-Semitism. INSKEEP: Now, with that said, let's talk about the older Democrats - the older generation of Democrats. There were these remarks by Omar suggesting that support for Israel was all about money, that supporters of Israel in the U.S. had allegiance to a foreign country. This is what bothered people like the House Speaker Nancy Pelosi. Let's listen to some of what she had to say about Omar's remarks and about what they really meant. NANCY PELOSI: I don't think that that the congresswoman, perhaps, appreciated the full weight of how it was heard by other people, although I don't believe it was intended in any anti-Semitic way. INSKEEP: Pelosi had been seen as a unifying force up to now. Does she have control of things? DAVIS: You know, in the end, all Democrats voted for it. So I think, yes, you could say leadership, ultimately, were - was able to pull out a victory here. She did upset a lot of her younger members - a lot of Democrats who got up inside private meetings and said they weren't appreciative of how leadership kind of threw this on the table and forced to vote on it. I think it was a lesson for the leadership that the Democratic Party she's leading now is different than the one that she led 10 years ago. And Nancy Pelosi, if anything, is very good at course correcting.